Champlain Valley Hops is a growing hop farm in Starksboro, Vermont. 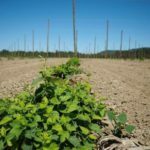 The farm goals are to grow and process quality hop products for Vermont brewers. They are currently in the process of improving their land, building hop trellises and planting hops. 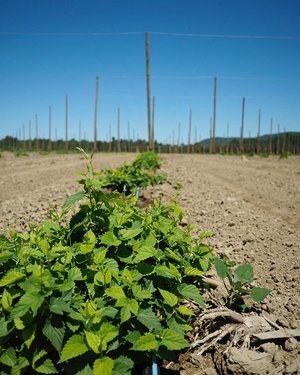 Join UVM Extension Northwest Crops and Soils staff Heather Darby, Scott Lewins and John Bruce, along with Champlain Valley Hops crew Peter Briggs and Julian Post to learn how they established their hop yard, including weed management and irrigation strategies. There are 26 acres trellised and 18 acres planted with hop varieties: Centennial, Willamette, Crystal, Cascade, Magnum, Chinook, Nugget. This entry was posted on Thursday, September 13th, 2018 at 11:13 am and is filed under Uncategorized. You can follow any responses to this entry through the RSS 2.0 feed. You can leave a response, or trackback from your own site.